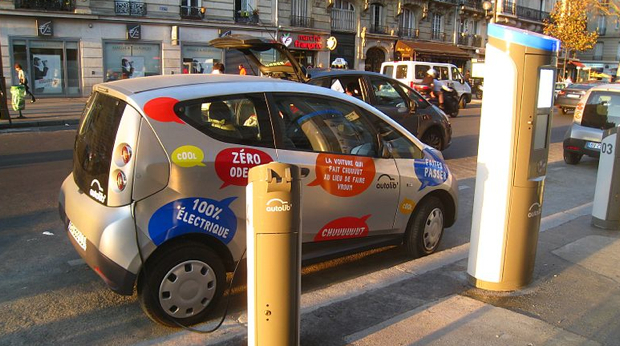 Autolib’: Could Paris’s Electric Car Share Be A Test Case For Cities Around The World? Its massive bike share program showed that major cities could let citizens rent bikes, and inspired cities like New York and D.C. to follow suit. Next up: Sharing city-owned electric cars. Public transport is moving faster than ever. Paris, confident after its widely successful Velib’ bike-sharing program, is moving into motors: electric ones. The new Autolib’ program (a play on liberté, the the French word for liberty) launched on Sunday. It is a public car scheme expected to grow from its current 66 vehicles to 250 by December, and then to more than 3,000 vehicles by 2012 in the French capital and surrounding cities. Billionaire investor Vincent Bolloré teamed up with Bertrand Delanoë, the socialist mayor of Paris, to launch the venture. Today, if you fly into the City of Light, you can already pedal around the city car (and care) free after paying a small Velib’ membership fee. Short bicycle trips are free, and the 20,000 bikes are taken on millions of trips each year. The city’s shared bike system even inspired similar program here in the U.S., such as CapitalBikeshare installed in Washington D.C., and New York’s soon-to-launch program. But such city-run car-sharing options have failed to materialize as fast as bike sharing, for obvious reasons. Autolib’ estimates it will need at least 80,000 users to turn a profit. At about $12 per hour, and a $189 annual fee, it’s still a bargain in Europe where private transport and fuel are much more expensive than in the U.S. While the U.S. has yet to see a municipally run car sharing program, nonprofit groups like the San Francisco group City Car Share, Chicago’s I-Go Carsharing, and Boulder’s e-Go Carshare have gotten into the game mostly dominated by the for-profit Zipcar. Then there’s carpooling, which in Europe is now getting hundreds of thousands of people around through sites like Carpooling.com, while sites like RelayRides, WhipCar, Spride, and Getaround allow you to rent out your car when it’s not in use. But perhaps, just as Paris’s successful bike share inspired New York and D.C., Autolib’ may soon have its own set of U.S. descendants.